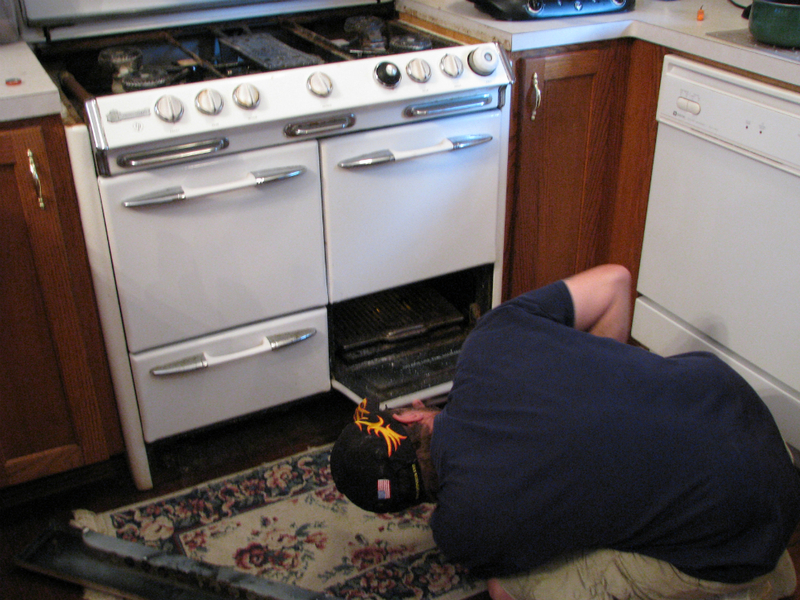 When we bought the bed and breakfast the house had a few things that were old…..
One item of note is the O’Keeffe & Merritt stove/oven in the kitchen. While very cool to look at we were a little intimidated by it in the beginning. First of all it didn’t work as well as our inspector said so we had to make a decision. So I called the insurance company to see if we could get it fixed. Well “certainly you may” they said, so off I go to find someone to look at it because as you may know Insurance companies only allow certain people to do work for them. After many phone calls and a bit of disappointment I finally found someone close to come and look at it. He came, looked and told me he’d been to work on it a few years back with no luck then. So off he goes down the road. “Now what?” we ask ourselves, it is a very cool old stove. Now mind you we called a lot of places for advice and were told by many of them that there was no way they could help and if they were willing to we would have to bring it to them. This stove is H-E-A-V-Y so I can only imagine that is part of the problem, no one wants to touch it. So off we go to the store to buy a George Forman Grill and a two burner unit so we can at least cook something for our selves to eat. While we really don’t want to get rid of the stove because it is kind of cool looking and it must have worked when the previous owners lived here we took a few days to decide what to do next. We moved onto the next item on our agenda and met the Innkeeper in town who had been taking care of the reservations under the old ownership. We were explaining to him our problems with the stove. “Oh I have one of those stoves and it works beautifully!” Our eyes lit up as we listened to him explain some of the parts we should look at and how we should adjust a few to see if it would work. (Thank you Hugh!) OK so now we have hope in our hearts. The first thing David did when we got home was to look on-line for a manual, low and behold there was one. 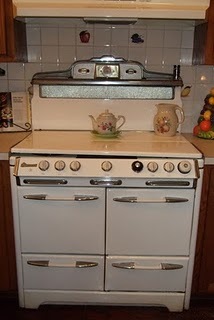 And we found out that ours is a 1952 model and found a lot of information about the stoves. Turns out there are quite a few places that refurbish and remodel them across the country. So now armed with this information David sets off to work on the stove. Turns on the gas and tries to get the burners to light. 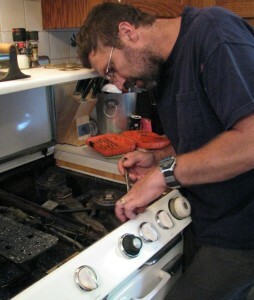 No such luck, he cleans parts one after the other and tries again. Now a few of the burners light on their own but others are still a bit stubborn. Back to the manual he goes with no instructions for this. He then contacts one of the companies that refurbishes them, tells him the problem. This man says we need this grease to fix the problem. An order was sent and the grease arrives, now to work on it again. Well what do you know it works! 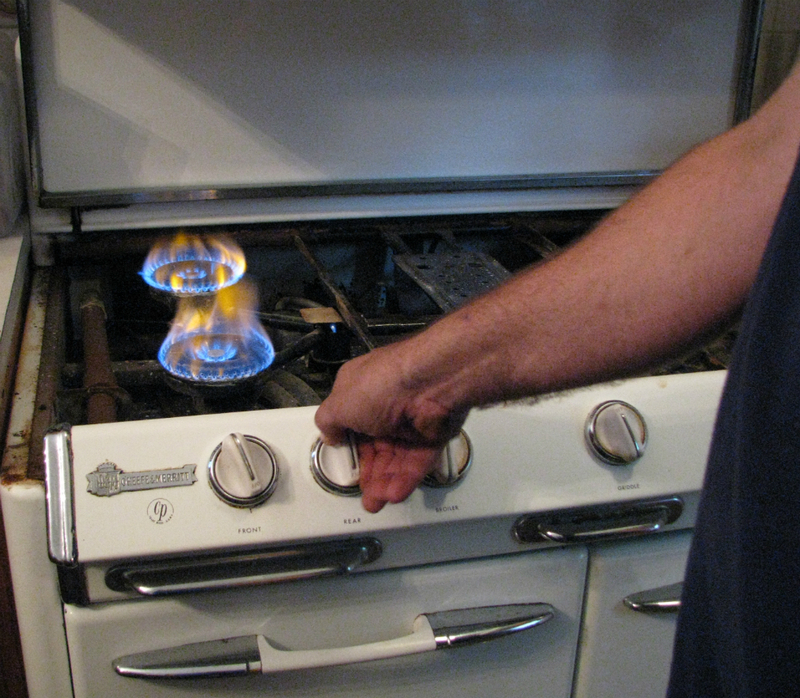 While working on this stove we realized that while not everyone wants old things there are some advantages to them. For instance they are much easier to work on without computer parts. They are easier to clean because most everything comes apart so you can get to it. They were intended to last a lifetime not like today where everything is disposable. And because it is different than what we see everyday it is beautiful to look at. Oh the stories it could tell if it could talk! We now have this lovely old stove that works and as you know it is essential for a bed and breakfast to have proper working equipment so we can make you the most fabulous breakfasts while you are our guests. Now we can. Follow along on our journey to be the best Bed and Breakfast in Jefferson Texas for you to unwind when you get the chance for a little rest and relaxation away from your everyday life. This entry was posted in Renovation by Tammy D. Bookmark the permalink.